At its core, retirement planning is based on assumptions. You have to take a guess at how long you'll live, what kind of long-term returns the stock market will produce, what your "necessary" expenses like medical bills or long-term care will be, and what lifestyle you hope to afford. Those are all incredibly hard to predict. You'll also have to make a guess about what age you'll stop working. Many young people write off the importance of retirement savings by simply stating "I love my job, so I'll work until I'm 70." Not all retirements are voluntary. Many young people underestimate the impact their health might have on their ability to work, and many healthy 60-year-olds find themselves laid off in during times that the economy turns sour. Seniors struggle to find an employer who's willing to hire and train them. Step 1: First guess how much you'll want to spend in a given year. Since you've made a budget and you know what your annual expenses are, you should have a good idea of how much you're currently spending. Bear in mind that some of your current expenses will no longer be needed in retirement - for example, your house might be fully paid off. But you will have new expenses. Your car insurance rates will rise when you become a senior. You may need to retrofit your home based on a physical limitation or disability. You may want to help send your grandkids to college. You may have to care for a disabled sibling. You may simply want to travel more. Step 2: Multiply the amount you'll need to spend in a given year - your annual expenses - by 25 to 33. This range represents the rough amount you'll need when you retire. For example, if you need $40,000 to cover your yearly cost of living, you'll need $40,000 x 25 = $1 million to retire as a conservative estimate, or $40,000 x 33 = $1.32 million as a more generous estimate. Why multiply by 25 to 33? It assumes that your money will earn a "real" return -- after inflation -- of 3% (multiplying by 33) to 4% (multiplying by 25). Legendary investor Warren Buffet said he expects the long-term growth of U.S. stocks to come to a long-term annualized average of 7%, so that’s a decent metric to use when you’re estimating how much your stock portfolios will return. U.S. inflation rates have held steady at around 3% over the long-term, so that's also a decent assumption to use. Based on those figures, your "real" return would be 7% minus 3% inflation, or 4%. Since you won't have all your money in stock funds -- you'll be diversified into safer investments like bonds and cash -- we like to use the 3% "real return" metric. This should only be used as a rough guide. Some retirees find that they spend the most money during the first few years of their retirement when they have the health and energy to travel overseas, upgrade their kitchen, buy a sailboat and join the tennis club. As time goes by, retirees sometimes begin to take part in fewer activities, which causes them to spend less. Furthermore, it's hard to predict what your tax rates, gas and electricity rates or water and sewage rates will be decades from now. It's also nearly impossible to guess how much Medicare or Social Security will provide, especially if you're currently in your 20's or 30's. The bottom line is that it's important to have options and flexibility as you age. 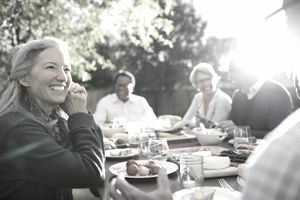 If the economy turns sour, if you get laid off at age 59, if your health declines or if gas and energy prices skyrocket, you'll be comforted during your senior years by the fact that you have a comfortable cushion or safety net to fall back upon. That's the main reason why we encourage you to slightly over-estimate how much you'll need for retirement - even if you love your job and you never want to stop working. How Much Should I Spend on a Wedding?